I hope everybody had a Blessed Easter! Please take a quick moment out of your busy schedule to see how to develop Premarital Counseling forms along with downloading the free sample forms and Premarital Counseling Sessions Certificate (picture to right). Also, check out "Setting Up a Housing Allowance" that is available to ministers, and "QuickBooks for Nonprofits" eBook or paperpack book that will not want to live without if you work with QuickBooks (accounting software). Shepherdbase - Are you finding yourself overwhelmed in the office? Shepherdbase will save you a lot of time in your church office. Shepherdbase - Church Membership Database will track memberships (unlimited with one time fee), contributions, attendance and much more for ONLY $34.99 by High Demand so Hurry & Enjoy these Savings! It has been proven that premarital counseling helps lower divorce rates and improves the relationship harmony down the road. Premarital counseling allows couples to identify problem areas and develop tacts before patterns of resentment and distrust develop in the marriage. In our state of Oklahoma if you have at least 4 hours of premarital counseling you can get a discount on your marriage license. 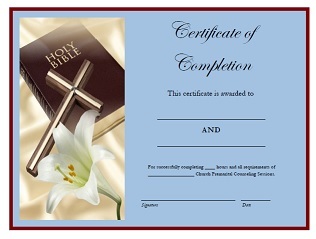 In some states, the Premarital Counseling Certificate (free to download below) is enough for them to bring to get discount and then in some states you have to fill out their specific state forms and then the counselor, groom-to-be and bride-to-be will be required to sign and date the form also. Where are you from origially? Have you been married before? If yes, when did divorce take place? Have you had any previous counseling? If yes, explain. Do you have children? If yes, name(s) and age(s) of chilren. Are your parents alive? If yes, describe your relationship with your parents. How close do they live? Are they supportive of your wedding plans? What is our religious background? Describe your devotion to your faith? These forms or questionnaires below are samples and can be modified to fit your church counseling needs. The Premarital Counseling Sessions Certificate of Completion is often used to obtain some marriage licenses so feel free to download this beautiful free certificate also. Click Here to download the Free Premarital Counseling Form(s)-Questionnaire(s) and/or the Premarital Counseling Certificate. Does your nonprofit organization or church use QuickBooks (#1 bestselling financial software) for their accounting needs? If yes, the "QuickBooks® for Churches and Other Religious Organizations [E-book]" is a must for you! I just recently told you about this book and since then Lisa London, CPA (author of these books) has came out with the "QuickBooks® for Nonprofit Organizations, Associations, & Clubs" (eBook or paperback) which covers a lot more than just churches. Lisa is an affiliate of mine and I had the privilege of meeting Lisa personally just recently and she is a very unique, extremely intelligent and precious person who has the same burden as I do to help God's people. She has the only church accounting guide to the #1 bestselling financial software. Bookkeeping for churches can be quite different than for-profit businesses, or even non-profit organizations. Most books and guides available today are focused on either QuickBooks or church accounting alone, but not both. 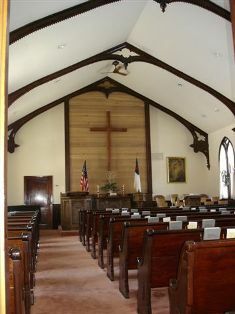 QuickBooks® for Churches and Other Religious Organizations is the only Quickbooks guidebook written especially for churches. Lisa will walk you through QuickBooks from start to finish, complete with examples, terminology, and everything a busy church administrator or bookkeeper needs to know. If you want to make your life easier when working with QuickBooks then you need to buy one or more of these books! Click the link(s) below for more information on Lisa's books or to purchase the books. A housing allowance is the greatest tax benefit available to ministers. It is also one of the least understood. It is simply a portion of a minister’s compensation that is so designated in advance by the minister’s employing church. It is very beneficial for ministers because an allowance for housing is excluded from federal income tax. However, it is not exempt from the minister’s self-employment tax...more on that later. Your church must make sure the amount they designate as an allowance for housing is determined beforehand. It should be included in a board approved resolution and properly documented in the church records. Most of the time, it is reviewed and adjusted before the beginning of each new budget year. Your church does not have anything to do with the second condition. The minister has the responsibility of tracking actual housing expenses and determining the fair rental value of the housing. Click Here to Read More on "Setting Up a Housing Allowance". Shepherdbase (Church Membership Database) is ONLY $34.99. You will also receive 2 Offering Envelope Templates, Church Auto-Monthly (change to any month or year with click of button) Calendars and Offering Count Sheet free as a Bonus for purchasing Shepherdbase! Hurry and Enjoy these Savings! If you purchased Shepherdbase before Sept. 2011 and would like to receive the latest new updated version of "Shepherdbase" (December 2013 Upgrade) free of charge contact me. This great CD has all the free church forms, certificates, brochures, flyers...(700+) on FreeChurchForms.com along with 4 Bonuses as a Thank You for purchasing the CD all for one special price of $13.99 plus shipping and handling ($7.00 in the U.S. or $27.00 outside the U.S.). 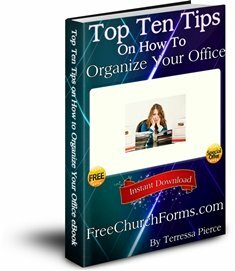 Church forms, certificates, flyers...(700+ forms each in PDF and Microsoft Office Word 2007 or higher version format - some in Excel). Also continually updated to include the latest forms created.